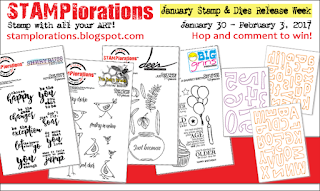 It's STAMPlorations release week, and we've got some fabulous goodies for you to drool over. 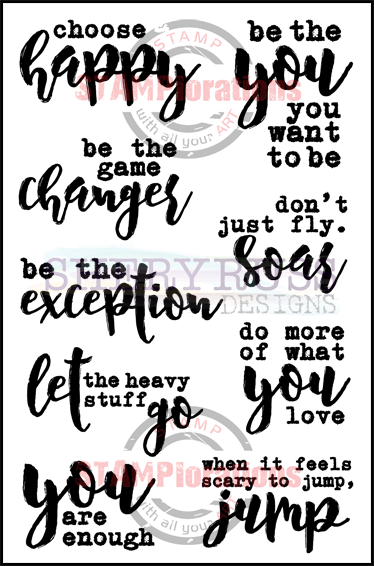 First up is Shery's latest stamp set, Noteworthy 2, packed with encouragement quotes. I chose the 'jump' quote because I couldn't resist pairing it with this little guy, who you'll see again tomorrow. I scribbled the side of a house for him to jump off. Hmm, might design a large house stamp, whaddaya think? I'm trying a different approach with my photography this week. I've always admired those people who can stage gorgeous photos without taking anything away from the card, so I thought I'd study them and see if I could attempt something similar. Whaddaya think? 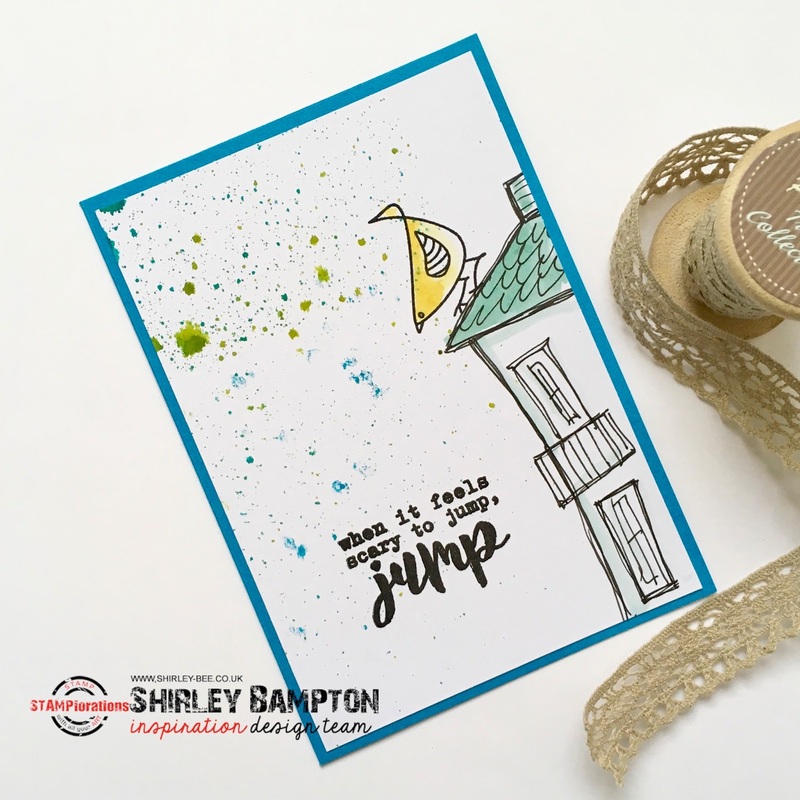 Pop on over to the STAMPlorations blog for some more fabulous inspiration from the Design Team, and get commenting for more chances to win! What a cute card - the image really works with the sentiment. This is a really cute card. Love your new set. Love them all! Perfect quote for this fun scene you imagined! Fun card! Love the splatters in the background! The house is perfect for the sentiment. Fabulous card...love that sweet sentiment. Awesome card! Love the cute bird with the sentiment you used! Brilliant card Shirley. Love the artsy feel. So cute. That sentiment is awesome, we've all been there. Such a fun card!!! 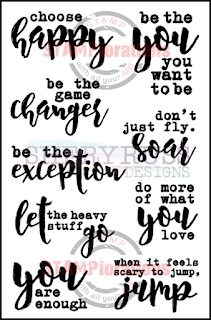 Love so much the sentiments of this new beautiful stamp set!!! Perfect pairing, love the quote stamps set and the little bird looks like a winner too! LOve your birds, Shirley ... and your scribbling? 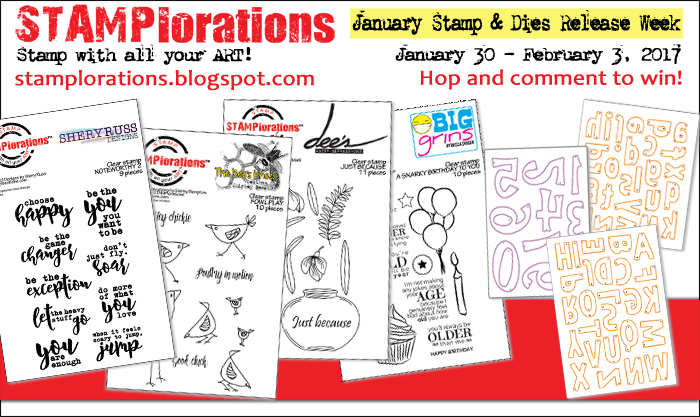 yes, would make a fabulous set to add to my growing addiction to house stamps/dies!!! Fabulous. Love the little bird and the house you scribbled. Great photography too. How clever to use a bird image for this sentiment. Thanks for sharing this card. So cute. Love the image and the sentiment. That's a cute card! You have made the perfect pair by choosing the stamps of bird and sentiment, and the house to top it all! Oh, if I had wings, I would not be afraid! .....lucky bird! Love the colors and the house-bird-sentiment mix! - Great! First of all...I love your 'scribbled' house! My goodness, if I could 'scribble' even 1/4 as good as you, I'd be dancing a jig of joy! Love the paint splatters and LOVE your whimsical and fun idea! perfect scene for the sentiment Shirley! What a cute Card!!! love your scribbled house..
love the cute scribble images especially the bird. So cute and so perfect with the new sentiment!! Love your card. Too cute. Great pairing of sentiment and image! Umpteen apologies for being MIA; my scheduled 7 days of marking diploma exams transformed into 12 (talk about blurry eyes!) which saw me falling behind in leaving real comments. Hopefully, you received the thought-bubble ones, as your gallery has been nothing short of marvelous! Starting here; fingers crossed I can stay caught up for while! Your card is sheer delight, from the doodled house to the whimsical bird to the fabulous sentiment! This one, in particular, fits my niece...she's a 'jump right in there' girl! CUTplorations - Are You Playing Along? Craft Stamper Take It Make It!